Even if you aren't a big baseball fan, viewing photos of the awe-inspiring view of downtown Pittsburgh, the Roberto Clemente Bridge, and Pittsburgh's three rivers beyond the center field wall will give you reason enough to see a ballgame at PNC Park. Home of the MLB Pittsburgh Pirates, PNC Park was selected as the best ballpark in Major League Baseball ESPN for its "perfect blend of location, history, design, comfort, and baseball." PNC Park has five entrances, including this home plate entrance located at the corner of General Robinson Street and Mazeroski Way. The dominating Home Plate Rotunda, a continuous ramp from street level up to each seating level, is adorned with actual newspaper headlines celebrating the best moments in Pirates history. The ceremonial groundbreaking for PNC Park took place on April 7, 1999, and the opening day took place just two years later on April 9, 2001, with a sellout crowd of 36,954. 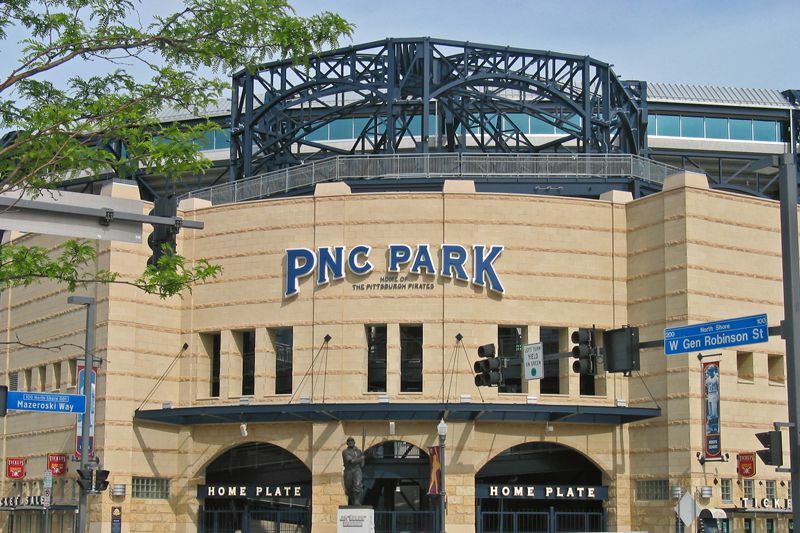 It is named PNC Park after PNC Bank, who paid in excess of $30 million for the naming rights. Even if you aren't a big baseball fan, the gorgeous view of downtown Pittsburgh and Pittsburgh's three rivers is reason enough to see a ball game at PNC Park. There's no such thing as a bad seat at PNC Park. Sunset views from centerfield are especially breathtaking, with the Allegheny River, Roberto Clemente Bridge and downtown Pittsburgh taking center stage. The outer promenade at PNC Park in this photo is known as the River Walk and provides views of downtown Pittsburgh, the Allegheny River, and the field. One of three exquisite statues erected outside of PNC Park, Roberto Clemente stands between the Center Field entrance and the Roberto Clemente Bridge. The three life-sized statues outside of PNC Park honor the Pirates most legendary players. The Honus Wagner statue was originally placed at Forbes Field, then moved on to Three Rivers Stadium, before its current place of honor in front of PNC Park's home plate main gate. Roberto Clemente's statue was also moved from Three Rivers Stadium to its current location outside of the center field entrance. The third statue, commemorating Willie Stargell, was unveiled just two days before PNC Park opened, ironically the same day that Willie Stargell died. He never got the chance to see his statue in person. Pirates' head groundskeeper Steve Peeler and his crew put in long hours to keep the 2.5-acre playing field at PNC Park in tip-top shape. The natural grass and dirt playing field at PNC Park takes a lot of work. Just mowing those pretty patterns you see for each ballgame can take hours. Then there's the fertilizing, watering and even resodding. You won't see brown spots at PNC Park either. If the grass isn't cooperating, then out comes the green spray paint! The Roberto Clemente Bridge is closed to vehicular traffic on game days, providing a safe, pedestrian walkway between downtown Pittsburgh and PNC Park. The outfield wall at PNC Park drops to just six feet in left field, offering close and personal views of the field from the left field bleachers. From its North Side site, PNC Park provides dramatic sweeping views of downtown Pittsburgh and the Allegheny River from almost every seat in the house. It's 320 feet down the rightfield line at PNC Park and 443 feet 4 inches from the plate to the Allegheny River. Down the Allegheny River from PNC Park three gold bridges, referred to as the "Three Sisters" gleam in the sun. PNC Park's state of the art scoreboard sits high above the bleachers in left field and measures 144 feet wide and 60 feet tall. The view into PNC Park from the Roberto Clemente Bridge, which spans the Allegheny River between the park and downtown Pittsburgh.